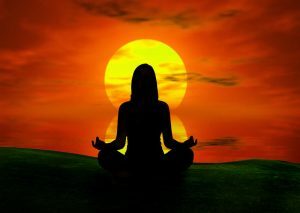 During the course you’ll create an ELO for a pretend student who loves yoga. Note: this is a course about ELOs themselves, not how to set up an ELO program at your school. 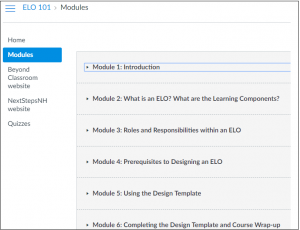 Introduction to ELOs is available on a learning management platform called Canvas. You can take the course without registering. However, setting up an account makes it easier to find your way back to the course since it will be listed on your dashboard. Format: Self-paced, with open-ended start and finish dates. Frequent activities. Estimated time to complete: 2.5 – 5 hours if you take the time to do all the activities. You can work at your own pace, on your own schedule. Academic credit: There are no grades. You’ll be able to print a completion certificate at the end of the course. Audience: preservice and inservice educators. Also suitable for parents, youth and community partners interested in learning more about ELOs. Instructor: This course is self-paced and unmonitored. Answers to activities are supplied within the course. See below for resources to learn more about ELOs. The following people devoted several hours each to careful 1:1 testing and discussion of both the course content and mechanics. Thank you!